Zambia’s Ambassador to Germany His Excellency Anthony Mukwita said value addition is expected to expand the Zambian economy by bringing on board more employment opportunities and increased foreign currency revenue. 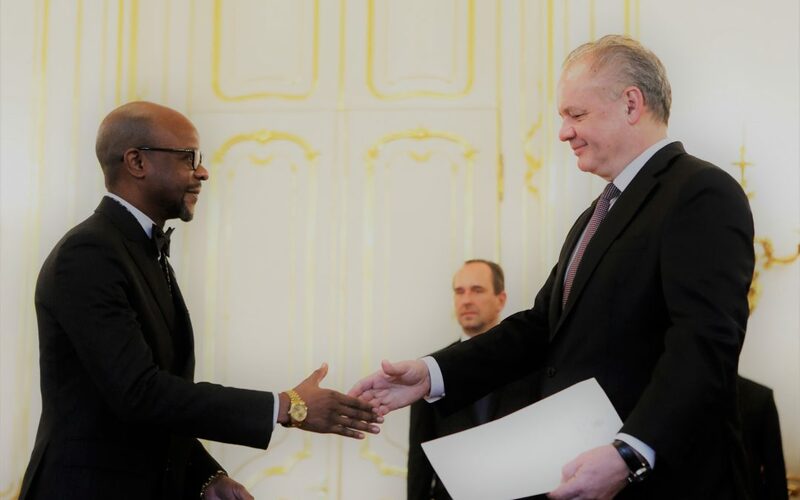 Speaking in the Slovak Republic shortly after presenting his credentials to H.E President Andrej Kiska, Ambassador Mukwita said exporting raw materials alone has not expanded the Zambian revenue base to meet the demands of a growing population. He was responding to a question posed by President Kiska who wanted to know how copper, Zambia’s mainstay of the economy was doing. “Prices keep fluctuating hence government’s decision to do value addition and gradually diversify,” Ambassador Mukwita said. He noted that the Slovak Republic was a manufacturer of motor vehicles that included VW, Range Rover and Jaguar, among many other well-known brands including KIA, which helps boost its economy remarkably. As copper is used to manufacture a number of components that go into a motor vehicle, Ambassador Mukwita said an opportunity for collaboration in the area of value addition is available between the Slovak economy and Zambia’s. Apart from copper, Zambia is endowed with a wide range of natural resources that include agricultural produce. In this regard, the Zambian government is encouraging agro processing industries so that such fruits as mangoes, for instance, may be processed into fruit drinks for both the domestic and export markets. Similar initiatives are underway in the processing of honey, pineapples, sweet potatoes, cassava, and many more. Examples of value addition already underway in Zambia may be seen in the processing of sunflower seeds into cooking oil, tea and coffee. “The opportunities for value addition are huge in more areas such as cotton which can be processed into finished clothing material”, Ambassador Mukwita later remarked as he reflected on the brief exchange with the Slovak leader. Under President Edgar Lungu, the structure of the Zambian economy is receiving significant attention that includes countrywide infrastructure developments, the establishment of industrial parks, Multi Facility Economic Zones in addition to the policies of diversification and value addition. Ambassador Mukwita, based in the German capital of Berlin is accredited on a non-residential basis to six other countries that include Hungary, Poland, Austria, Slovenia, the Czech Republic and the Slovak Republic.